When I was 13 I read Diary of A Young Girl and it had such a profound impact on my life. The words that Anne Frank wrote down in her diary about the human spirit and hope and the joy of being alive were so beautiful and inspiring that I couldn't help but be become overly interested in reading other war diaries and testimonies fictional acounts of the events of the Holocaust. But nothing came close to how I felt at reading Anne's diary. So I was a teensy bit worried before I picked up this book at how Annexed by Sharon Dogar would affect or change the way I felt about Anne's original diary. But I needn't have worried. Sharon Dogar really put in a lot of thought and consideration as well as research into this fictional story about life in the annex and beyond from Peter's perspective. 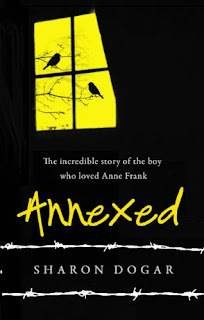 Annexed is beautifully crafted and it really brought back all of the strong feelings I felt as well as a heap of nostalgia about reading Anne Frank's Diary all those years ago. I thought the change in perspective was wonderfully done, showing us the scenes readers are already familiar with from Anne's point of view and giving them a bit of a twist. Showing us a different side to the other people who lived in the Annex alongside Anne and Peter and giving them different but believeable motivations for their actions and the things that they've said. I loved delving into Peter's head. A young man, cooped indoors for years as he's helpless to stand up and fight like he dreams of doing, thinking of the girl he left behind. He spends a lot of time pondering his own beliefs about God and the Jewish religion and war. There's such beauty in the way that Sharon Dogar unfolds Peter's story to us, with snippets of Peter's life outside of the Annex, in Auschwitz as he looks back at this time living with the Franks. It seems as though his memories are sharper and more focused, as Peter faces death in the infirmary and every word is laced with the strength of the human spirit and hope. It was very difficult for me to put this book down once I'd begun, because I couldn't turn my eyes away from Peter's suffering and this wisdom that he imparts with us, the reader. There is a large section of the narrative focused on the Peter's struggle with Anne's diary that I'd never considered before. It surely is the basis of such a novel like Annexed - how did the other people living in the Annex feel about Anne writing about them all? How did Peter, who begins as the boy who loathes Anne and transforms into the boy who loves her, feel about their lives and personalities being written from an Anne-only perspective? It's a very interesting idea and one that made me think quite a lot. But where Anne's diary leaves off before the Frank and van Pels family are captured, Peter's story continues into the ghastly treatment of those in Auschwitz. The dehumanising conditions and hard work. It brings the atrocities of the Holocaust and all of the emotion that I felt back to me again. Annexed is an excellent piece of writing and companion to Anne Frank's Diary and a book that I'm happy to recommend. I have this one to read soon. I've been putting it off since I'm sure it'll be a pretty tough read. I'm interested to read it though. The Diary of a Young Girl had a big impact on me when I read it at 14 too.I have a copy of 'Annexed' but I've been putting it off as I don't feel like anything can compare to the diary and the impact it has had. Leanna - It really wasn't as tough to read as I'd imagined it to be. The writing is quite beautiful and apart from the end, there are only snippets of horror from Peter's perspective in the infirmary. Hayley - I agree, it's hard to compare the two, but for me, this one had the same sort of feeling about it as I was reading that it really transported me back into my frame of mind of younger me reading Anne Frank's diary for the first time. I want to read this. Actually, I NEED to read this! I have read Anne Frank's diary so many times, thank you for this lovely review. Zoe - It is a really wonderful book, beautifully written! Annexed seems interesting - to see the same story (and more) from another point of view.